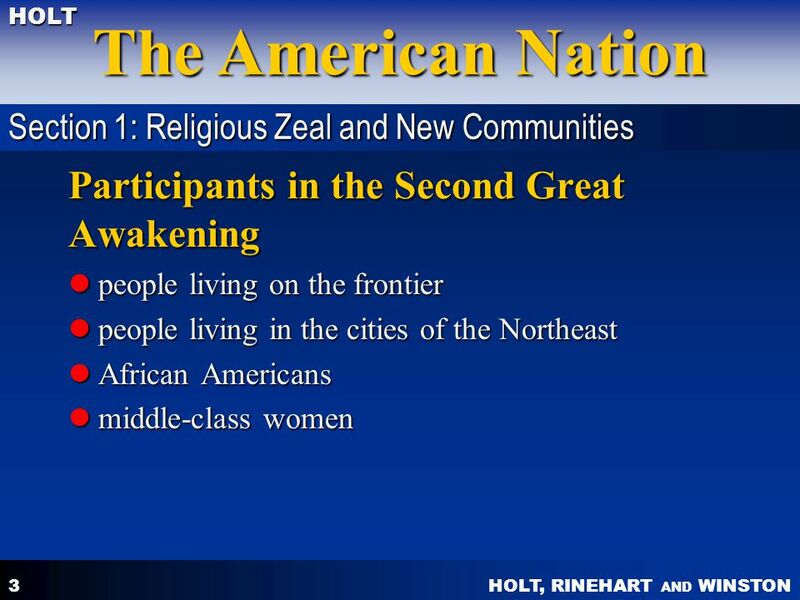 Who participated in the Second Great Awakening? 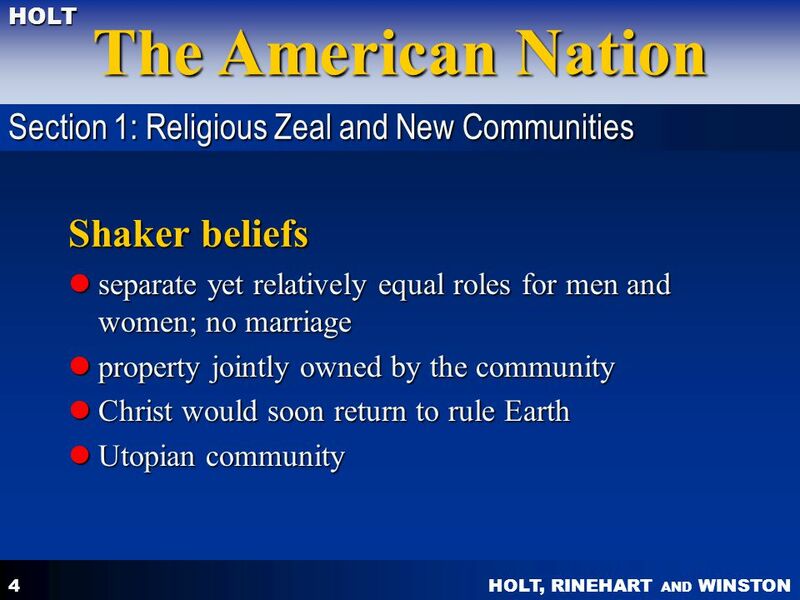 What were the main characteristics of the Shakers and Mormons? 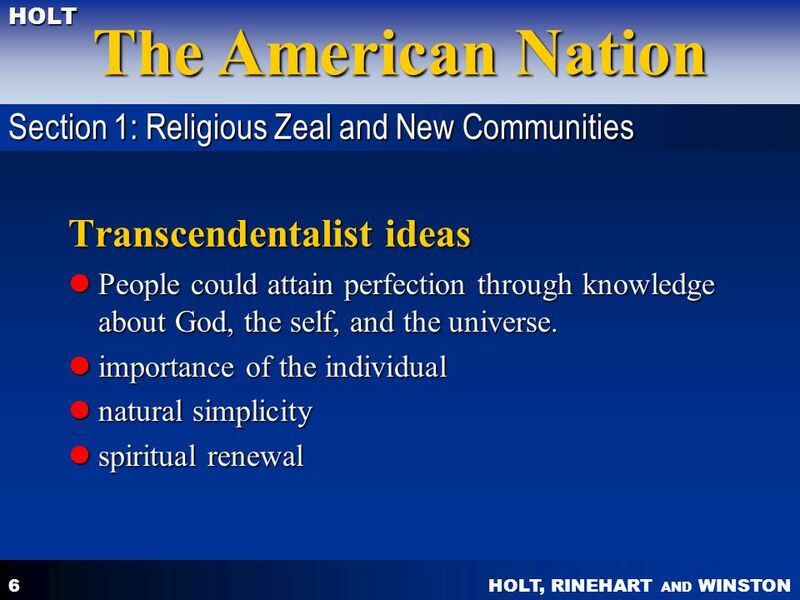 What ideas did transcendentalism promote? 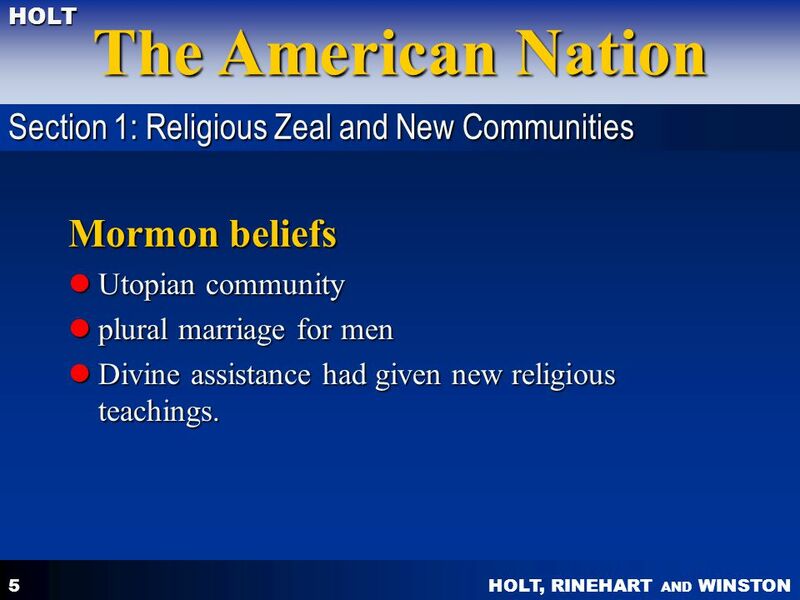 Utopian community plural marriage for men Divine assistance had given new religious teachings. 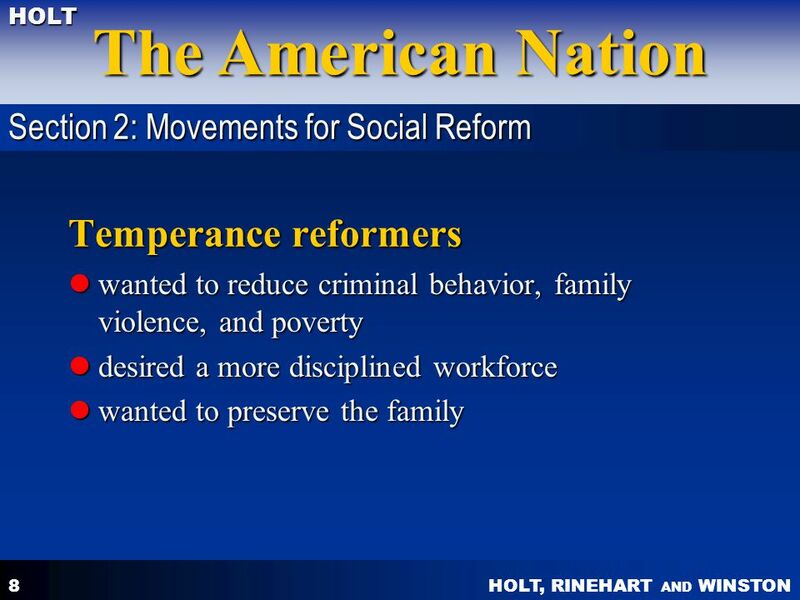 What motivated temperance reformers? Why did some women believe it was important to become involved in reform movements? 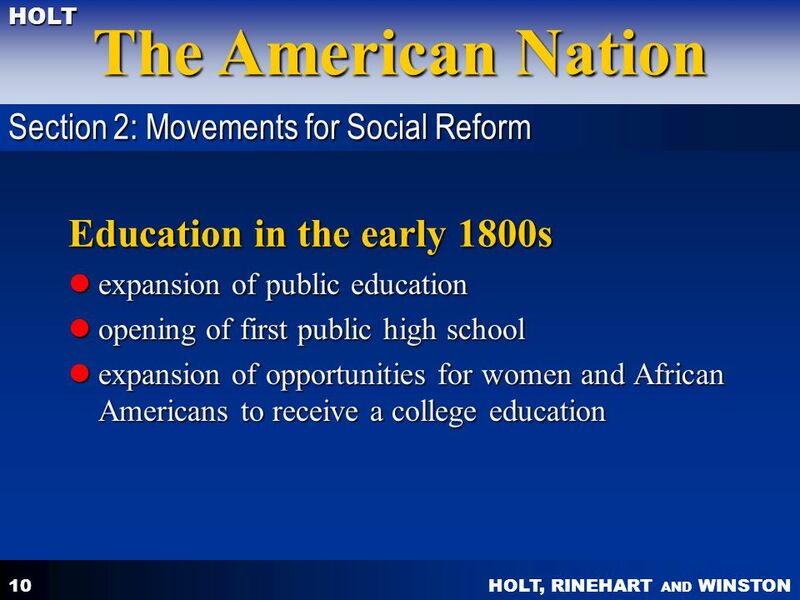 How did educational opportunities change in the early 1800s? 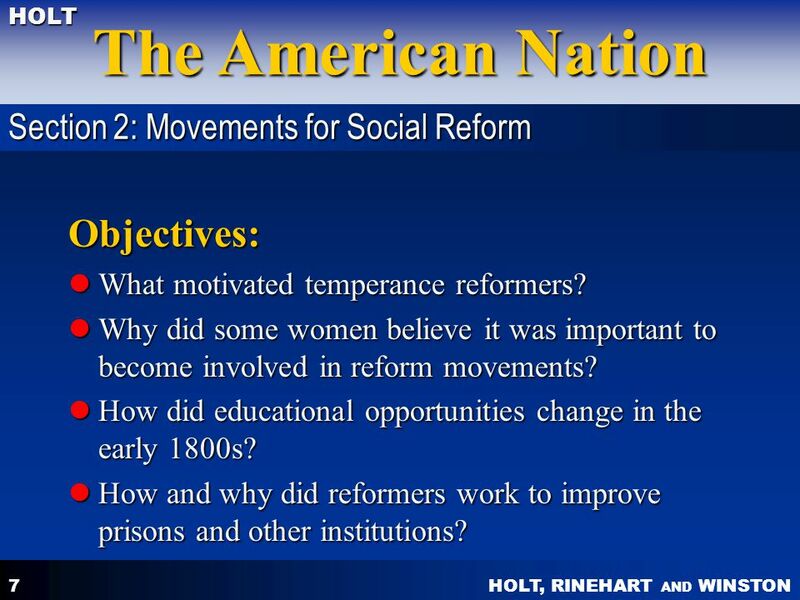 How and why did reformers work to improve prisons and other institutions? 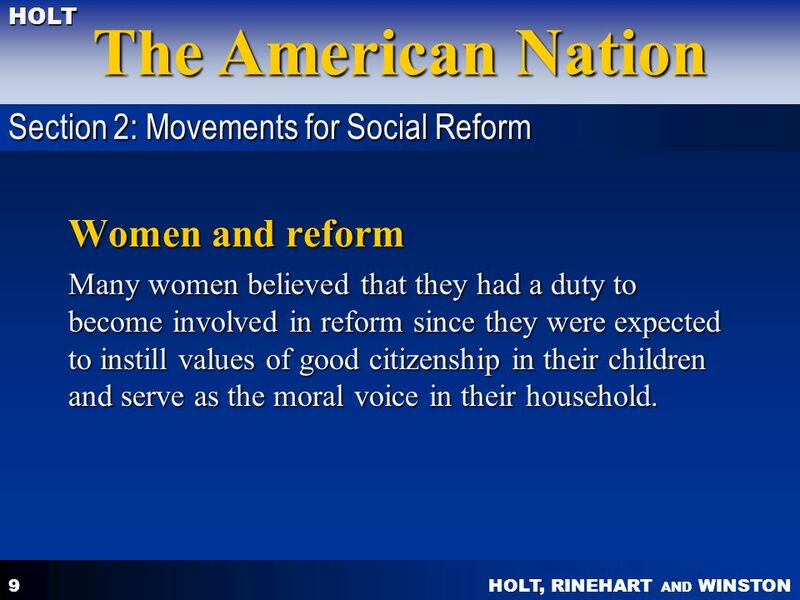 Many women believed that they had a duty to become involved in reform since they were expected to instill values of good citizenship in their children and serve as the moral voice in their household. 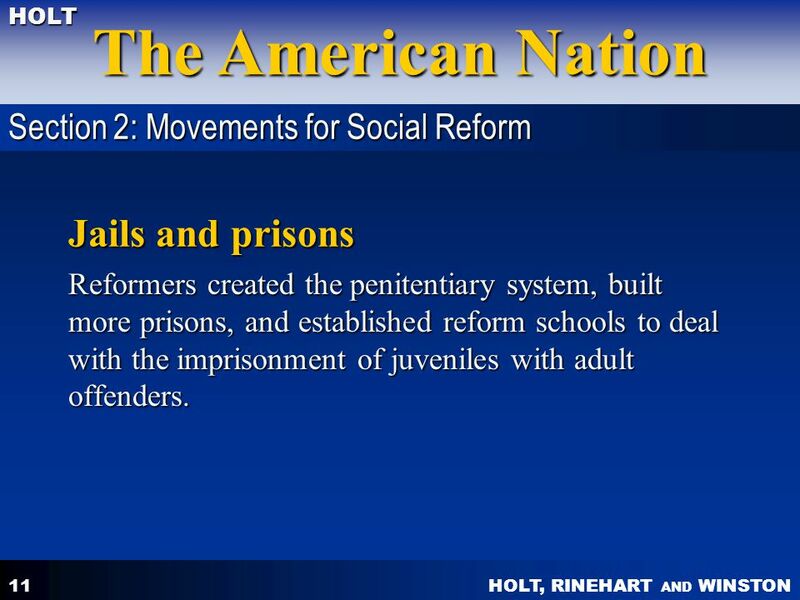 Reformers created the penitentiary system, built more prisons, and established reform schools to deal with the imprisonment of juveniles with adult offenders. 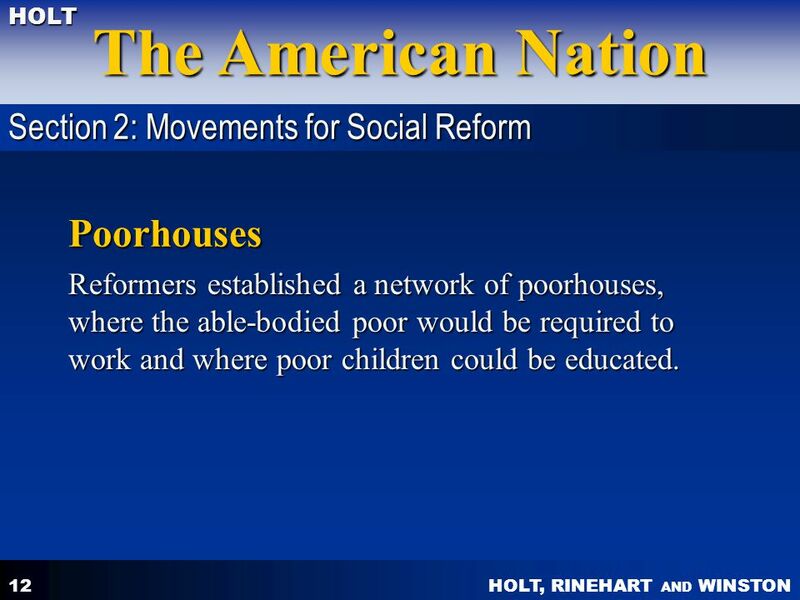 Reformers established a network of poorhouses, where the able-bodied poor would be required to work and where poor children could be educated. 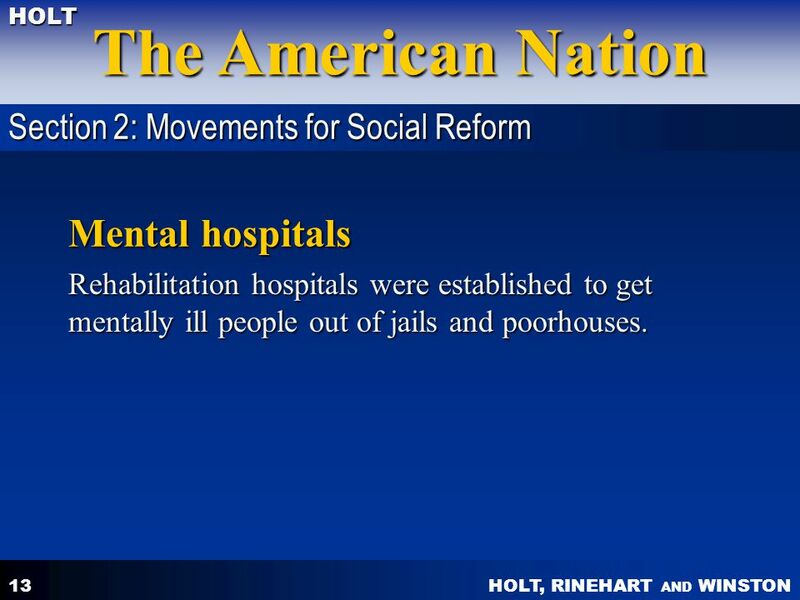 Rehabilitation hospitals were established to get mentally ill people out of jails and poorhouses. 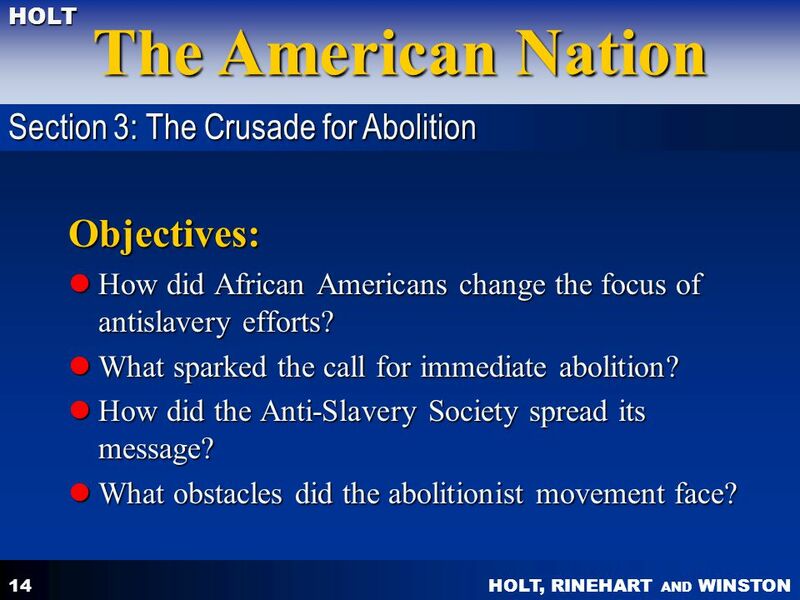 How did African Americans change the focus of antislavery efforts? 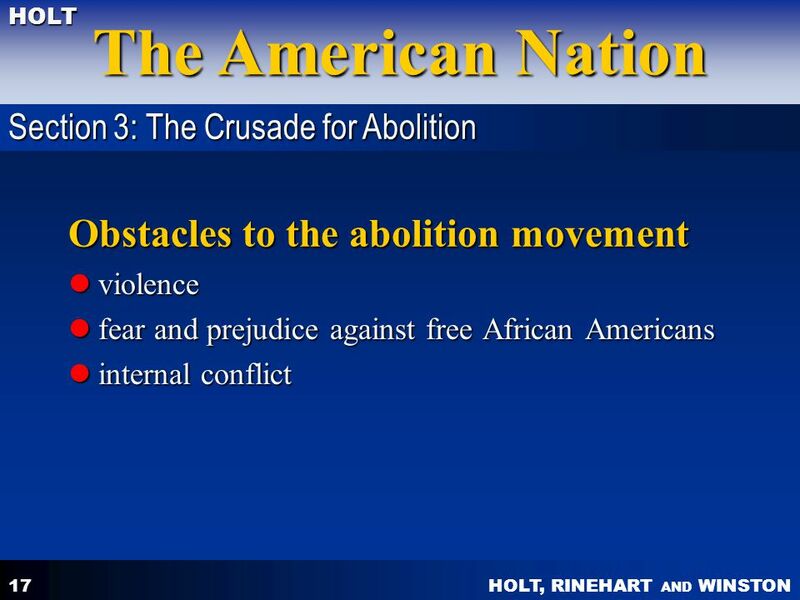 What sparked the call for immediate abolition? How did the Anti-Slavery Society spread its message? What obstacles did the abolitionist movement face? 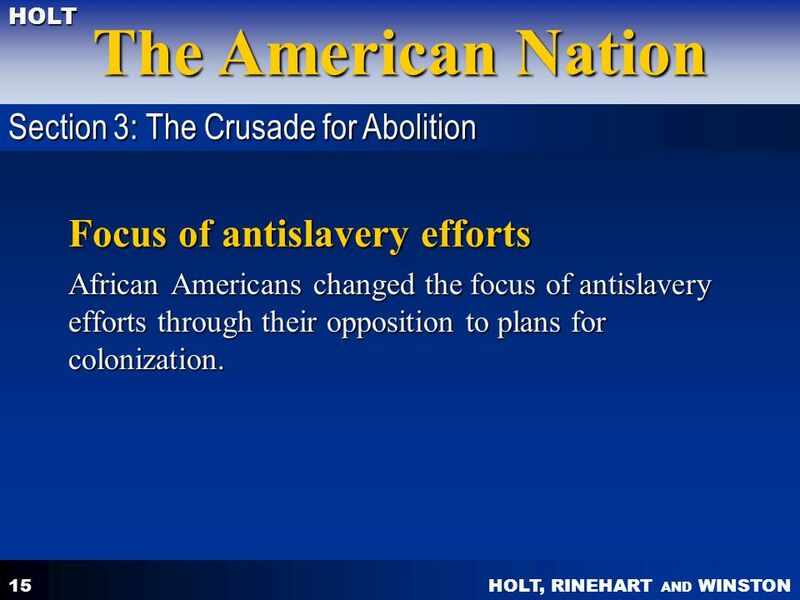 Section 3: The Crusade for Abolition Focus of antislavery efforts African Americans changed the focus of antislavery efforts through their opposition to plans for colonization. 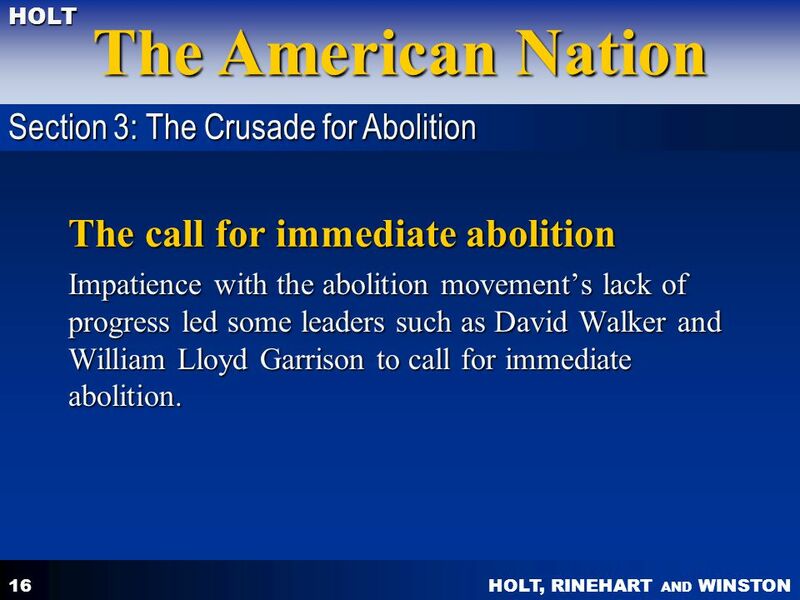 Section 3: The Crusade for Abolition The call for immediate abolition Impatience with the abolition movement’s lack of progress led some leaders such as David Walker and William Lloyd Garrison to call for immediate abolition. 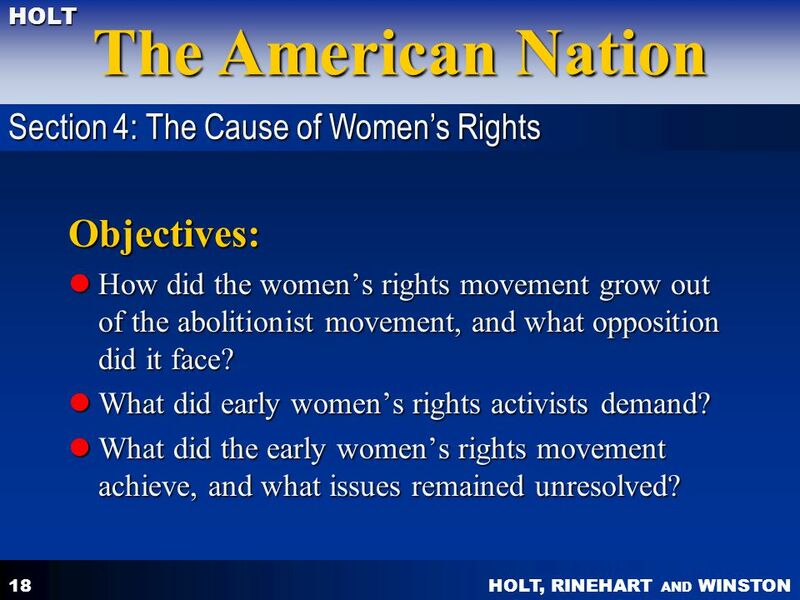 How did the women’s rights movement grow out of the abolitionist movement, and what opposition did it face? What did early women’s rights activists demand? What did the early women’s rights movement achieve, and what issues remained unresolved? 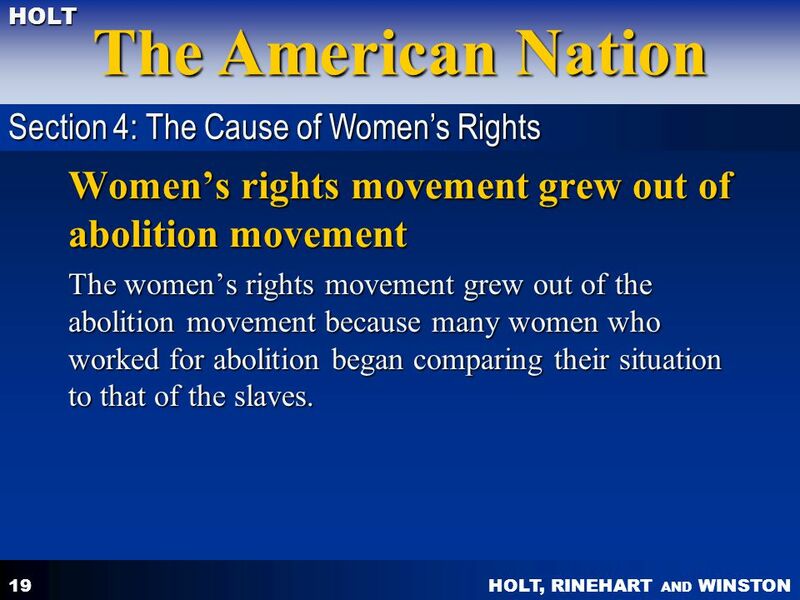 Section 4: The Cause of Women’s Rights Women’s rights movement grew out of abolition movement The women’s rights movement grew out of the abolition movement because many women who worked for abolition began comparing their situation to that of the slaves. 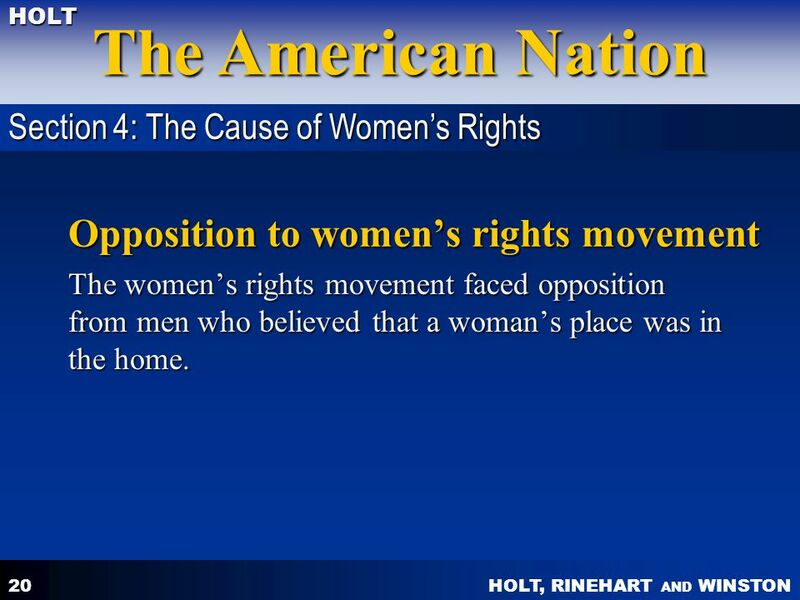 Section 4: The Cause of Women’s Rights Opposition to women’s rights movement The women’s rights movement faced opposition from men who believed that a woman’s place was in the home. 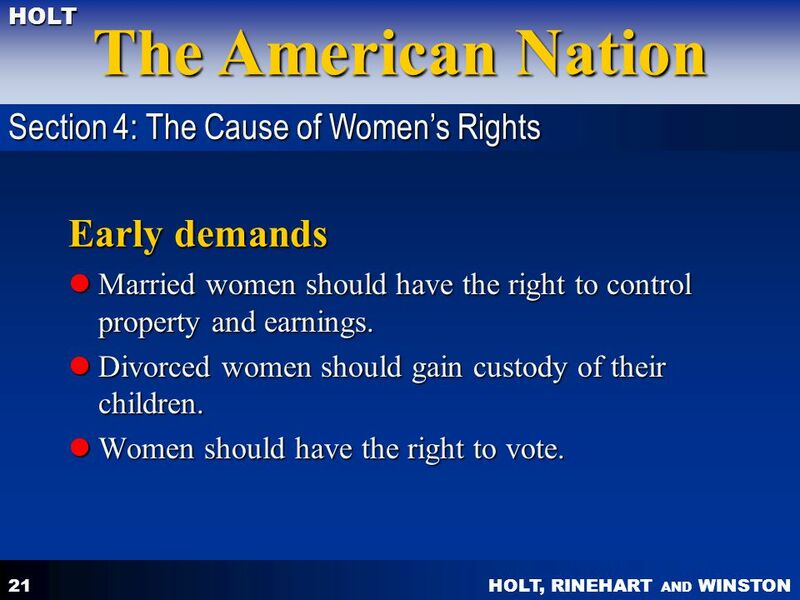 Married women should have the right to control property and earnings. Divorced women should gain custody of their children. 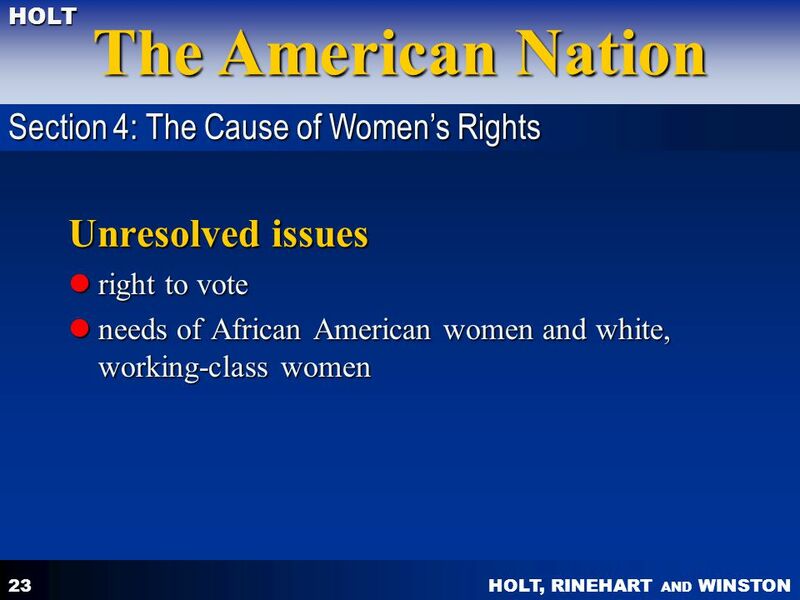 Women should have the right to vote. 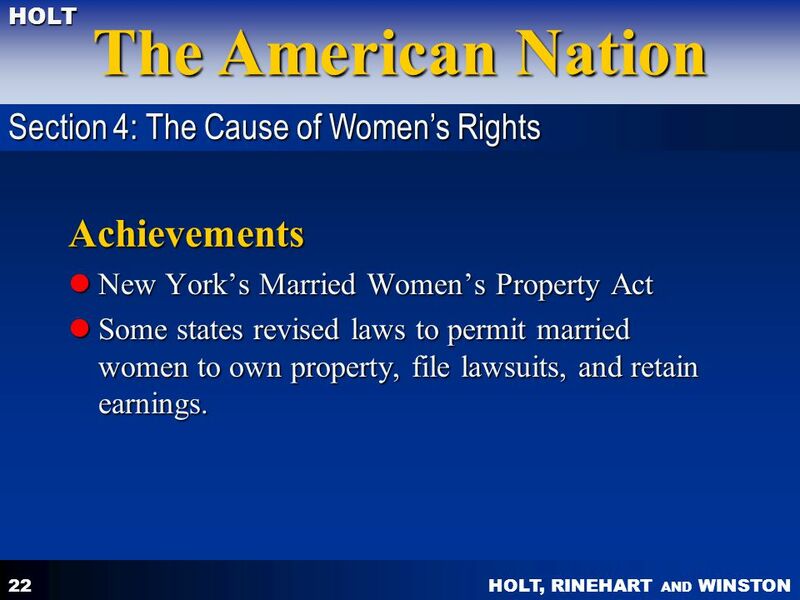 New York’s Married Women’s Property Act Some states revised laws to permit married women to own property, file lawsuits, and retain earnings. 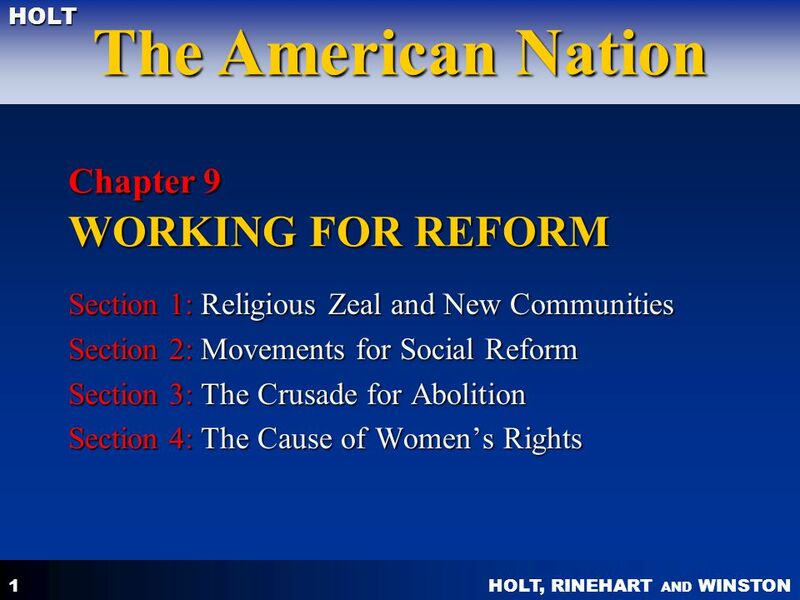 Download ppt "Chapter 9 WORKING FOR REFORM"
Jeopardy Q 1 Q 2 Q 3 Q 4 Q 5 Q 6Q 16Q 11Q 21 Q 7Q 12Q 17Q 22 Q 8Q 13Q 18 Q 23 Q 9 Q 14Q 19Q 24 Q 10Q 15Q 20Q 25 Final Jeopardy Westward Expansion. Transcendentalism A reform movement to get people to drink less. Belief that people could rise above the material needs of life. TEMPERANCE. The Women’s Movement Chapter 8 Section 4. Chapter 12 The Pursuit of Perfection. Phrenology “Science” could be bent for profit and sheer nonsense could become big business. Phrenology was the idea. Strive for Perfection. 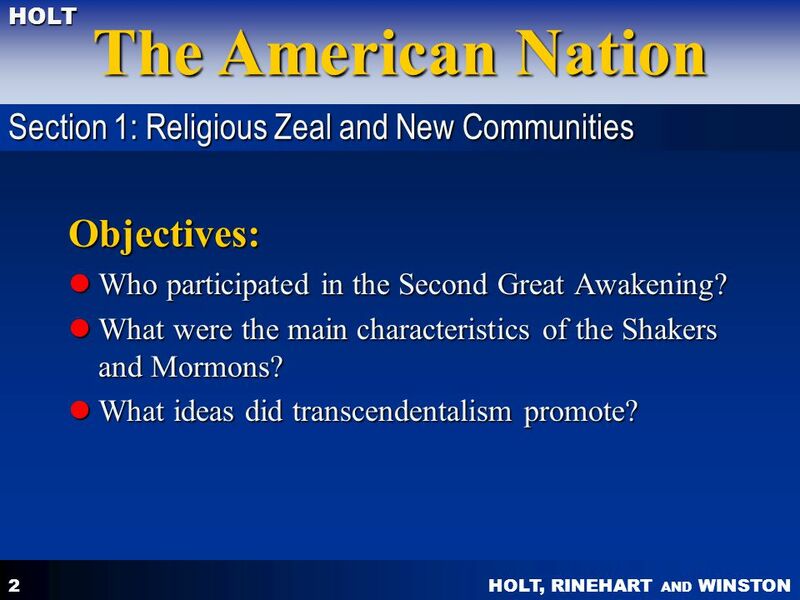 Key Concepts: “The Second Great Awakening unleashed a cascade of reform during the 1820s and 1830s….Some reformers withdrew from. Revivalism Charles G. Finney PROBLEMS TO SOLVE Lack of Faith & Personal Responsibility Challenged the belief that God had predestined your salvation. Era of Reform Reasons for Reform Temperance and The Bottle Prison and Asylum Education and Leadership. Bellwork How closely aligned to you think the abolitionist movement was to the women’s rights movement?